field day on Friday. Photo LJWorld. Call it revenge for 2005. Call it whatever you want -- LHS made a statement against Olathe East in the final week of this year's regular season. The onslaught began with two LHS first quarter touchdown runs; the first on a 58-yarder from JD Woods and the second on a 53-yard run from Ivan Hollins. Olathe East stayed in the game with a 13-yard touchdown pass from Chase Miller to Anthony McCray. But before the quarter ended, Woods punched in a five-yard touchdown run to give the Chesty Lions a comfortable 21-7 lead. On the ensuing possession, Olathe East pulled close, once again, when they capped a drive with a three-yard touchdown run from Jalen Branson. LHS answered with a one-yard touchdown run from Woods to make things 28-14. Olathe East fumbled on their next possession, and Price Morgan recovered the loose ball and took it back 46 yards for a touchdown to give LHS a bigger advantage. Just before the half, Ellis Springe added a 41-yard field goal to give LHS a 38-14 lead. Olathe East opened scoring in the second half with a five-yard touchdown run from Branson to make things 38-21. LHS came back with three touchdown runs, the first a 43-yarder from Woods, the second an 18-yarder from Woods, and the third a 41-yarder from Trey Moore to make the lead 59-21. Branson took a carry in from seven yards out to start the fourth quarter, making the game 59-28. 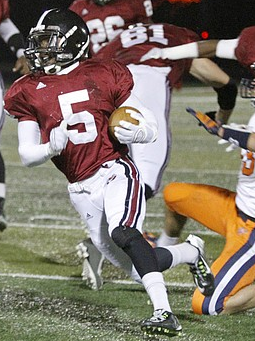 LHS' final score came on the ensuing kickoff on an 85-yard kick return for a touchdown by Nyle Anderson. Three weeks ago Free State entered the most challenging 6A West district. Three games later, the Firebirds appear to be playing as well as any team in the state. Free State opened scoring with a three-yard touchdown run from Bryce Torneden. Topeka answered with a 41-yard touchdown pass from Alec Beatty to Khalil Austin. Free State came back with a 72-yard touchdown run from Khaury El-Amin to go up 13-6. Topeka added a field goal on their next drive to make the game 13-9. Before the end of the first quarter, Torneden took a carry 66 yards for a touchdown to go up 19-9. Beatty found Austin on an 18-yard touchdown pass in the first 10 second of the second quarter to make the score 19-16. On the ensuing kickoff, Carson Bowen returned the kick 87 yards for a touchdown to give Free State a 26-16 lead. Topeka came back with a drive which was capped off with a nine-yard touchdown run from Mike McCoy to make things 26-23. Free State then gained a little breathing room, scoring the final two touchdowns of the half on a 51-yard pass from Torneden to Joel Spain and an eight-yard touchdown pass from Torneden to Andrew Keating. The Firebirds led 39-23 at the half. At the start of the third quarter, Bowen added a 21-yard touchdown run to go up 47-23. Topeka finally answered, on their next drive, with a 34-yard touchdown pass from Beatty to Austin, to make things 47-30. Beatty added a seven-yard touchdown run just before the end of the quarter to make the game 47-37. The only score of the fourth quarter was a 21-yard touchdown run from El-Amin. The Eagles quietly and methodically shut down their neighbors to the northwest. Olathe North started scoring with a 20-yard touchdown run from Cole Murphy in the first quarter to go up 7-0. In the second quarter, Murphy found Mark Keeling on an 11-yard touchdown pass to make the game 14-0 at halftime. A third quarter Venus Triplett touchdown run of 25 yards made the game 20-0. SM North hung close for part of the first half, but ultimately SM East had too many weapons to contain. SM East got on the board first with a 38-yard touchdown pass from Gunnar Englund to Sky Tate. They added another first quarter touchdown on a four-yard run from Wyatt Edmisten to go up 14-0. Late in the first quarter, Will Schneider found Nick Perez on a 43-yard touchdown pass to make the game 14-6. Edmisten answered early in the second quarter with a 34-yard touchdown pass to make the game 21-6. SM North put together a nice drive to answer, scoring on a two-yard touchdown run from Terrick Bell to pull to within nine at 21-12. But SM East scored all the points from there. Englund added a nine-yard touchdown run and a 32-yard touchdown pass to Sam Huffman to put the Lancers up 35-12 at halftime. In the third quarter, Englund found Tate on a 35-yard touchdown pass, before he found Alec Dean on a 14-yarder to make the game 49-12. In the fourth quarter Edmisten added a seven-yard touchdown run, and Parker Shirling took a score in from three yards out to give the Lancers nine touchdowns on the evening. After a scoreless first quarter, SM South struck first on a nine-yard touchdown pass from Matt Hollingsworth to Marshall Bland. SM Northwest came back with a 69-yard touchdown pass from Clay Drouilliard to Mitchell Hodson to pull to within one at 7-6. Before halftime, SM South was able to add a seven-yard touchdown pass from Hollingsworth to Tyler Perdue to make things 13-6 at the intermission. Hollingsworth added the only points of the third quarter on a six-yard touchdown run to make things 20-6. Next, Bland scored on a 13-yard touchdown run in the fourth quarter to make the lead 27-6. SM Northwest didn't go out quietly, adding a 45-yard touchdown run from Sam Sullivan and a two-yard touchdown run from Drouilliard to pull to within seven, but that was a close as they would get. No box score was reported. For the first time in school history Leavenworth finished as the champions of their district. The Pioneers were led by Sanchez Williams, who carried the ball 22 times for 169 yards and three touchdowns. Also adding touchdowns were Isaiah Ross (one rushing and two receiving), Drew Sachen (one rushing and one passing), Landry Hodges (two passing), Anthony Hunt (fumble recovery) and Clifford Robinson (fumble recovery). No box score was reported. At one point in the third quarter, the Vikings trailed, 21-7. A late comeback tied the game, and SM West was able to clinch the district title and playoff berth on a field goal from Tyler Thayer as time expired on the game. No box score was reported. For Olathe South, this victory clinched their first playoff berth since 2011. With the loss, Gardner-Edgerton finished winless for the first time in school history.